Down with fever and flu and i thought maybe i should finish this post after my dose of paburon. Today, i’ll cover how to read the passage. Are you good with particles? If not, please revise your particles before the exam. Especially particles like 「を」、「に」、「で」、「から」、「まで」, etc. In 中文 and 長文、 all these particles can leave u reading the passage a lot of times, wasting a lot of time. Step 1:If there’s a name of a title at the bottom, read it. It will help you identify the topic. Step 2: Read all the nouns (circle them if you need). This will help you identify the topic very fast. 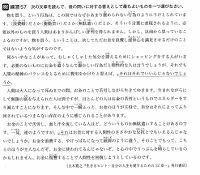 The following is taken from 新完全マスターN2読解. Step 3: Identify the words that appear more than once. 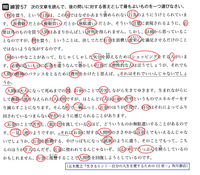 In this passage, words that appear more than once, 「お金」、「人間」、「人」、「苦労」、「物」、「必要」->Topic is about buying things? Step 4: While reading the passage, try to relate back to real life. Step 5: Reading the questions and options available. Box up all the nouns and underline all the ending portions of the sentences. You will be able to find out the differences between each sentence. Step 6: Solving the questions. The boxes will kinda correspond to what you are trying to find in the passage. So it will help you look for the answer more easily. 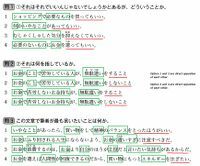 Notice a lot of tricky particles like 「より」、「から」 and beginner grammar like 「くてもいいです」 all come into place? That’s why it’s very important that you remember what you learn in Beginner and Intermediate. For N1 passages, at times, you need to guess and infer a bit (i.e the nouns that appear on the questions may not be the same as those in the passage). For N2 and N3, it’s quite straightforward. Different kinds of passages have different ways of solving, but the above is a general idea of how you should solve it.